I have been meaning to write this post for several days now. And since I am already halfway through my challenge list, I figure it is now or never. 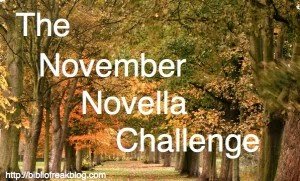 Bibliofreak is hosting a reading challenge this month based on novellas that looked pretty interesting. Too often I get interested in challenges but then don’t want to follow through on them once I have made my list. However, I knew I could complete this challenge just by taking things from my TBR pile. I tried to keep them under 150 pages (some sources say 120 pages is the top end of the novella range) and was only able to come up with four titles. So I guess that means I will only make it to Level II. If I come across others I won’t hesitate to shoot for Level III (eight novellas) before the end of the month, but I doubt that I find four more lurking somewhere in my collection. I have read the second and fourth. I'm interested about what you think of both, of course, but especially Cheerful Weather for the Wedding. Paperback Reader and Mel: Reviews coming soon. Stay tuned. Thanks for joining! I'm sorry it took me so long to stop by…I upgrade Mr. Linky and it's *supposed* to e-mail me whenever someone enters a link, but you know how reliable Mr. Linky is… Anyways, great to have you on board! J.T. : Thanks for stopping by. I have one more to go to finish my four. I might add four more by Edith Wharton that I just discovered in my TBR.